With so many American men overseas with the armed forces, American women helped keep the war effort and the economy in general going by working in factories or taking other employment outside the home. U.S. physicists raced against the clock, and sometimes their consciences, to develop an atomic bomb. After the Japanese bombing of Pearl Harbor, Americans did not suffer another successful attack on the homeland, but fears of another attack affected American policy. 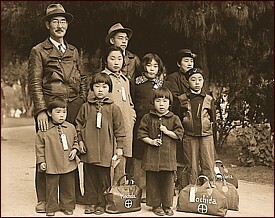 Americans of Japanese descent were sent to internment camps in inland areas, even though the vast majority were patriotic citizens, and many were relatives of Japanese-American soldiers serving overseas. Returning soldiers were profoundly changed by the war. Many found it difficult to talk about the violence they experienced; black G.I.s who had fought alongside white fellow soldiers returned to find racial prejudice still alive and well at home. Isabel Allende, The Japanese Lover (2015), about a young Polish woman sent to live with relatives in San Francisco in 1939, where she falls in love with the family's Japanese gardener. David Guterson, Snow Falling on Cedars (1994), about a man whose love for a Japanese-American girl sent to a relocation camp during World War II is reawakened after the war when her innocent husband is tried for murder; won the 1995 PEN/Faulkner Award. Joy Kogawa, Obasan (1994), about the relocation of Canadian citizens of Japanese descent to internment camps during World War II; based on the author's own experiences, so technically not a historical novel. Julie Otsuka, When the Emperor Was Divine (2003), about a Japanese-American family's experiences after Pearl Harbor, when the mother and children are interned in Utah while the father is sent to a camp in New Mexico. Lucy Sanna, The Cherry Harvest (2015), about a Wisconsin family whose lives are disrupted after they use German prisoners-of-war from a nearby camp to help with their cherry harvest. Jack Shakely, POWs at Chigger Lake (2010), about an American military officer responsible for opening and managing an internment camp for Italian prisoners of war in rural Oklahoma. Kevin Baker, Strivers Row (2006), about Malcolm X as a young man in 1943 Harlem; #3 in the City of Fire trilogy (#1 was set in 1910 and #2 in 1863 New York). Sarah Blake, The Postmistress (2010), about three women during the early years of World War II, two of them in a small town in Massachusetts and one an American reporter in London, whose lives connect and contrast as the reporter strives to convey the reality of the war and the women at home to avoid it. Amy Bloom, Lucky Us (2014), about two half-sisters in the 1940s who set out from Ohio in a stolen station wagon to go to Hollywood. Dennis Bock, The Ash Garden (2001), about the atom bomb and its effect on the lives of three people: a German scientist who helped America develop it, his Jewish Austrian wife, and a Japanese child in Hiroshima. Francesca Brill, The Harbour (2012), about an American woman working as a high society journalist in 1940s Hong Kong who must fight for survival after the Japanese occupy the island. Michael Chabon, The Amazing Adventures of Kavalier and Clay (2000), about a Jewish refugee and his American cousin who work in the comic-book business during the World War II years; won a 2001 Pulitzer Prize. J.S. Cook, Because You Despise Me (2009), a gay-themed thriller about an American man who runs a Moroccan brothel where a Nazi officer has recently been murdered, the French police officer who dares not reveal his love for the American, and a sadistic Nazi who comes to Morocco searching for a Resistance leader. John Crowley, The Four Freedoms (2009), about workers in an Oklahoma airplane factory during World War II, building the largest bomber ever built. Maggie Davis, Stage Door Canteen (2003), about hostesses at a New York dance club during World War II. Lander Duncan, Children of Secrets (2010), about a black war hero, his beautiful mixed-race wife, and the violent racial prejudice he returns to at the end of the war; self-published. Norman G. Gautreau, Sea Room (2002), about a boy in Maine whose father, a lobster fisherman, goes away to serve as an army medic, leaving the family to face numerous challenges. Gloria Goldreich, That Year of Our War (1994), about a Jewish American teenager who goes to live with relatives in New York City after her mother dies while her father is serving in the military. Elizabeth Graver, The End of the Point (2013), about the upsetting events during a family's stay at their summer house on the Massachusetts coast in 1942 as the U.S. enters World War II, and the generations that follow through the end of the twentieth century. Sara Gruen, At The Water’s Edge (2015), about a Philadelphia socialite and her husband who, to redeem themselves from disgrace, go to Scotland in 1944 to search for the Loch Ness Monster. Louisa Hall, Trinity (2018), about the brilliant scientist and developer of the atomic bomb, Robert Oppenheimer, from the perspective of seven fictional characters. Marjorie Herrera Lewis, When the Men Were Gone (2018), about Tylene Wilson, a Texas schoolteacher who during WWII became Texas’s first female high school football coach. Jack Woodville London, French Letters: Engaged in War (2010), about a young army doctor at the front in Normandy during D-Day; self-published; sequel to French Letters: Virginia's War. James MacManus, Sleep in Peace Tonight (2014), about Franklin Roosevelt's advisor Harry Hopkins and his involvement with a London woman during the Blitz. Paul Malmont, The Astounding, the Amazing, and the Unknown (2011), about group of science fiction writers including Robert Heinlein and Isaac Asimov who are asked to help America win World War II by turning fictional weapons into fact. Kristina McMorris, Letters from Home (2011), about three young Midwestern women, one of whom begins writing love letters to a serviceman overseas on behalf of her friend, and then begins falling in love with him herself. TaraShea Nesbit, The Wives of Los Alamos (2014), about the woman married to the men who developed the atom bomb in such absolute secrecy during World War II that they could not reveal the town they lived in. Marta Perry, The Forgiven (2014), historical romance about a present-day Amish widow and the Amish woman whose WWII-era diary she discovers, which helps give her the courage to move on; #1 in a planned series. Marge Piercy, Gone to Soldiers (1987), about the sacrifices of American women who remained at home during World War II. Rhonda Riley, The Enchanted Life of Adam Hope (2013), magical realism about a seventeen-year-old North Carolina girl who falls in love with a supernatural being she finds partially buried on her family's farm. Don Robertson, The Greatest Thing Since Sliced Bread (1965), about a nine-year-old Cleveland boy who sets out to visit a friend, towing his sister along in a red wagon, on the day in 1944 when a disastrous gas explosion is about to occur. Philip Roth, Nemesis (2010), about a young man whose weak eyes have kept him out of the army, and who works as a playground director during a polio epidemic in Newark, New Jersey, in the summer of 1944. Dana Sachs, The Secret of the Nightingale Palace (2013), about a woman's 85-year-old grandmother and her recollections of life in San Francisco during WWII, when she agrees to keep a portfolio of valuable Japanese prints safe during a friend's internment, as she begins a career in the fashion industry. Alan Simon, The First Christmas of the War (2010), about a family's Christmas celebration in 1941 after the attack on Pearl Harbor forces the U.S. into World War II; #1 in the Colelman Family Saga; self-published. Alan Simon, Thanksgiving, 1942 (2012), about a Pittsburgh family's Thanksgiving celebration in 1942 as the daughter dreams of fame in Hollywood and the sons come home on furlough from their Air Force training; #2 in the Coleman Family Saga; self-published. Sylvia Dickey Smith, A War of Her Own (2010), about a woman in Orange, Texas, who gets a job as a riveter in a shipyard in 1943 after her husband leaves her for another woman. Kathleen Spivack, Unspeakable Things (2016), creepy magical realism about intellectuals and musicians in New York City's European refugee community in the early 1940s. Elswyth Thane, This Was Tomorrow (1952), about two Virginia families during World War II; #6 in the Women of Williamsburg series; this novel was contemporary at the time it was written, although earlier novels in the series are genuine historical novels. Elswyth Thane, Homing (1957), about two Virginia families during World War II; #7 (and last) in the Women of Williamsburg series; this novel was contemporary at the time it was written, although earlier novels in the series are genuine historical novels. Hillary Tiefer, Lily’s Home Front (2018), about a young Jewish woman who works as a Liberty Ships welder in Portland, Oregon, during WWII while her husband is away on the battlefield. Adriana Trigiani, Tony’s Wife (2018), about a young Italian-American woman who sets aside her dream of a singing career to raise a family while her husband pursues his own career as a singer. Steve Amick, Nothing But a Smile (2009), a love story about an army illustrator discharged from the service after an injury to his drawing hand who returns to Chicago to discover his buddy's wife has been eking out a living producing pin-up photos for which she uses herself as a model. Margaret Atwood, The Blind Assassin (2000), a literary novel about an elderly Canadian woman recalling her sister's suicide in 1945, ten years after the end of World War II; it includes a story-within-the-story, the science-fiction novel written by the woman's sister. Calvin Baker, Once Two Heroes (2003), about two heroes of World War II, one black and one white, and the violence they experience in post-war America. Pam Jenoff, The Things We Cherished (2011), about two American lawyers who fall in love as they work together in Germany in the aftermath of World War II to defend an innocent man from being condemned as a war criminal. Donna Milner, The Promise of Rain (2010), about a Canadian girl born after her father returned from World War II, who struggles to uncover his secrets. Shira Nayman, The Listener (2009), about a psychiatrist in a New York asylum during the years immediately following World War II who studies the damaging effects of the war on the soldiers who fought it. William Styron, Sophie’s Choice (1979), a literary novel about a young man's gradual discovery of the trauma experienced in Nazi Germany by the beautiful Polish woman with whom he is infatuated. Kate Walbert, The Gardens of Kyoto (2001), about a woman remembering her much-admired older cousin, a soldier who died at Iwo Jima. Mignon F. Ballard, Miss Dimple Disappears (2011), about a first-grade teacher in Georgia who disappears in 1942 and the students who think she has been kidnapped by spies and try to find her; #1 in the Miss Dimple mystery series. Mignon F. Ballard, Miss Dimple Rallies to the Cause (2013), about a Georgia schoolteacher who tries to sort matters out after a skeleton is found in a creek bottom, funds raised in a war bond rally are stolen, and a bus driver disappears; #2 in the Miss Dimple mystery series. Mignon F. Ballard, Miss Dimple Suspects (2013), about a Georgia schoolteacher who tries to find the real killer after an innocent Asian woman is accused of murdering the elderly artist she works for; #3 in the Miss Dimple mystery series. Mignon B. Ballard, Miss Dimple Picks a Peck of Trouble (2014), about a Georgia schoolteacher who tries to find the real killer when a young woman is killed in 1944 and the boyfriend she recently broke up with is suspected of the crime; #4 in the Miss Dimple mystery series. Lauren Belfer, A Fierce Radiance (2010), about a photojournalist who falls in love with a scientist working to develop penicillin in New York, when a murder occurs in the research lab and she sets out to find the killer. Dan Fesperman, The Letter Writer (2016), a thriller about a North Carolina man who gets a job as a policeman in New York in the winter after Pearl Harbor and is assisted in identifying a body by a man who seems to have an unusual amount of information at his disposal. Kathryn Miller Haines, The Winter of Her Discontent (2008), about an aspiring actress in New York who tries to clear the name of a friend after he is accused of murdering his girlfriend; #3 in the Rosie Winter mystery series. Kathryn Miller Haines, The War Against Miss Winter (2009), about an aspiring actress in New York who takes a part-time job at a seedy detective agency; #3 in the Rosie Winter mystery series. Kathryn Miller Haines, Winter in June (2009), about an aspiring actress in New York who joins a USO troop on its way to the South Pacific and finds herself in the midst of a murder mystery; #3 in the Rosie Winter mystery series. Joseph Kanon, Stardust (2009), a mystery about a man who returns from service in Europe to discover his brother, a successful Hollywood actor, is on the brink of death after falling – or being pushed – from a window. Joseph Kanon, Los Alamos (1997), a thriller about a murder that occurs amid the clandestine effort to build an atomic bomb in New Mexico during World War II. Lenore Glen Offord, Skeleton Key (2015), about a widow in Berkeley, California, who discovers a dying air-raid warden while caught in a blackout. Sheldon Russell, The Yard Dog (2009), about a railroad security agent who is assigned to chase vagrants away from a rail yard near a prisoner-of-war camp and suspects murder when a coal-picker is run over by a train; #1 in the Hook Runyon mystery series. Sheldon Russell, The Insane Train (2010), about a railroad security agent put in charge of protecting the survivors of a disastrous fire at an insane asylum as they travel to a new location; #2 in the Hook Runyon mystery series. Michael C. White, A Brother's Blood (1996), set in the present day, about a woman's disturbing recollections of the 1945 disappearance of a German prisoner of war from a Maine logging camp, after his brother comes looking for information about who murdered him.